As you may know, deBebians is an authorized retailer of Forever Brilliant ® Moissanite and Forever One ™ Moissanite from Charles & Colvard. Forever Brilliant ® Moissanite is near colorless and is equivalent to a diamond with H-I color. Forever One ™ Moissanite is colorless and is equivalent to a diamond with D-F color. Moissanite is becoming increasingly popular because it is more affordable than a natural diamond, scores a 9.25 on Mohs scale of mineral hardness, and is a lab created stone. Below are just a few examples of our recently purchased engagement rings that are set with a moissanite from Charles & Colvard. This timeless engagement ring is a classic favorite. The ring has a width of approximately 2.7mm and is shown here with a 6.5mm Forever Brilliant ® Moissanite. This setting is available in 14kt gold, 18kt gold, palladium, or platinum. This milgrained engagement ring is shown here with a 9x7mm radiant cut Forever Brilliant ® Moissanite. The diamond accented engagement ring has a slight taper and graduated diamonds, which give the ring additional sparkle. The milgrain detail gives the ring an antique look and feel. 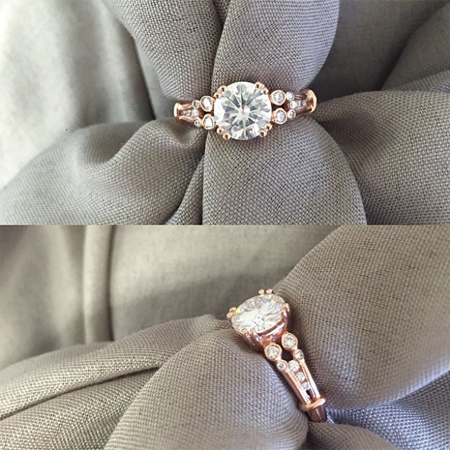 This vintage-inspired engagement ring is shown here in 14 karat rose gold. It is set with a 7.5mm round brilliant Forever One ™ Moissanite. The stone is colorless and looks beautiful paired with the rose gold. 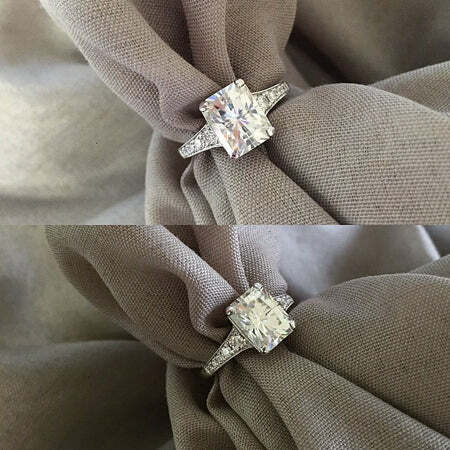 The double prongs accentuate the center stone and hold the stone into place securely. 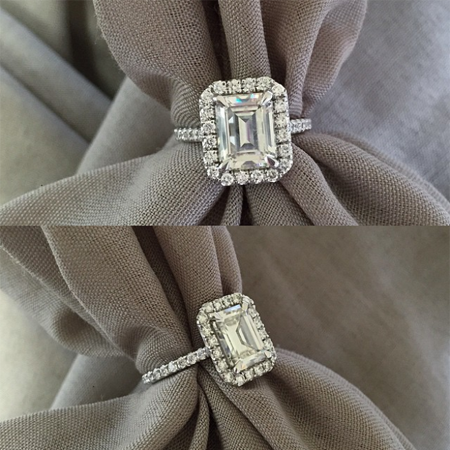 This halo engagement ring is set with a 9x7mm emerald cut Forever Brilliant ® Moissanite. The design is simple, but offers immense sparkle. The diamond halo gives the center stone the appearance of being even larger. If you have questions about moissanite, please contact a deBebians jewelry expert or check out our Moissanite Education Page. 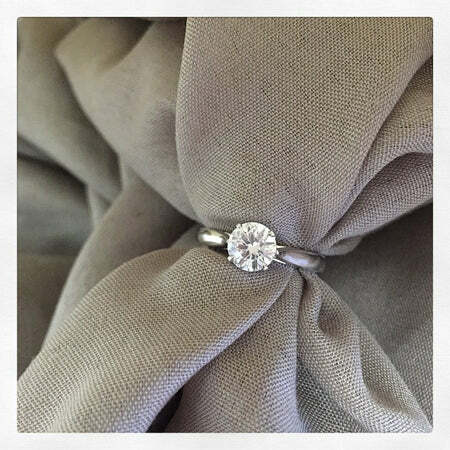 Please browse our moissanite engagement rings to see which styles that are currently offered from deBebians.